This sign will soon be replaced. - New Elk Creek Cafe + Aleworks chef Erin Snyder may not have won this year’s Golden Basket Awards at the Boalsburg Farmers Market, but she definitely made an impression. 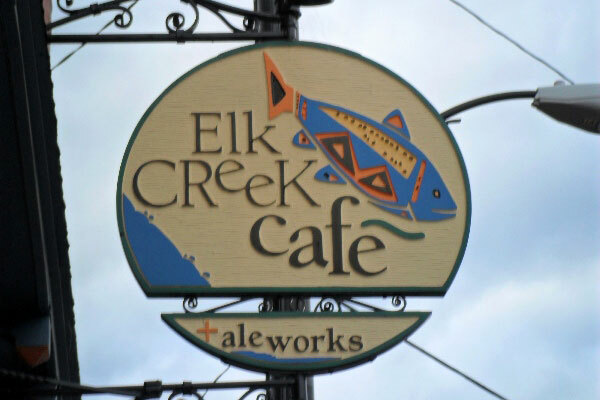 On Sunday, join Elk Creek owner Tim Bowser as he thanks the community for their support and gives a formal introduction of Chef Erin from 4:00-7:00 p.m. There will be samples of Erin’s new menu, samples of brewmaster Tim Yarrington’s new brews, and an unveiling of a new Elk Creek logo, sign, and website. - Are you a local food producer and/or vendor? Then heads up…the deadline to be part of the PASA Good Gifts Guide is Sept. 11. The Good Gifts Guide is PASA’s chance to spotlight our members this upcoming holiday season by showcasing the variety of goods and services they have to offer. Restaurants, food artisans, crafters, lodging locations, farm stores, brewers, vintners, retail outlets, web stores and more can all be included. They will launch the 2015 Guide on October 6th, so please sign-up here to be included. - Football season is almost here, and nothing beats a tailgate dish made with local food. Saturday at 11:00 a.m., Kim Tait and Cindy Tait Law of Tait Farms will be sharing local food tailgate recipes, from chili to tasty snacks that are sure to please your crowd.